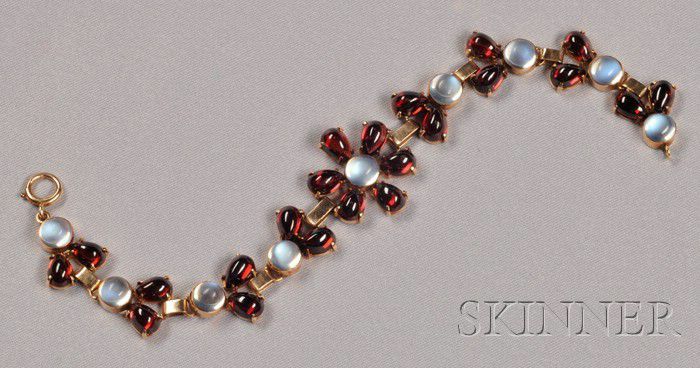 Retro 14kt Gold, Moonstone, and Garnet Bracelet, Binder Bros.
Retro 14kt Gold, Moonstone, and Garnet Bracelet, Binder Bros., New York, floral and foliate form set with cabochon moonstones and pear-shape cabochon garnets, lg. 1 in., maker's mark. Break to mount third station from clasp between moonstone and garnet, abrasions to stones sen mostly with a loupe. moonstones have nice adularescence.